Quantum mechanics may force you to think some wild things about the way the Universe works, but it has some real applications. One of the theory’s main quirks allows for a special kind of quantum link, one that can send incredibly secure messages or transmit data for quantum computing. Tests of these links exist on Earth, in space, and now, underwater. Chinese scientists have already set up this quantum link between the ground and a satellite, and even “quantum teleported” a particle (which is not really teleportation). 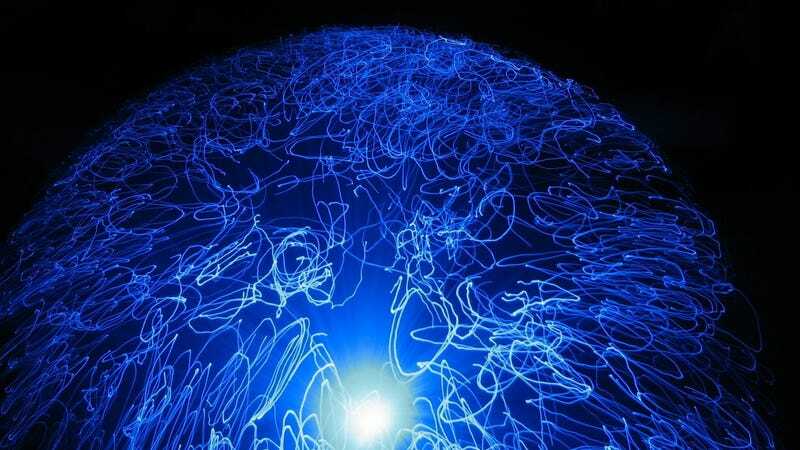 Given the importance of underwater communications like the fiber optics used to transmit telephone and internet data, one team reports that they’ve now performed the crucial test required to set up an underwater quantum link without any cables. The results are super preliminary, but “confirm the feasibility of a seawater quantum channel, representing the first step towards underwater quantum communication,” the researchers write in a study published this month in the journal Optics Express. Whether there will ever be an application for such an underwater link remains to be seen. But if the researchers are successful in the difficult challenge of extending it past the ten feet they tested it, it could mean a new way to send quantum-encrypted messages between submarines or send data from quantum computers between locations separated by water. Here’s your quick quantum mechanics crash course: The tiniest units of matter like electrons and photons (individual units of light) can behave like both waves and particles at the same time. Each of these units’ properties are “quantized,” meaning the properties can only take on certain assigned values. Before you actually observe the properties, it’s impossible to tell what the value is—you just get a probability assigned to each of the possible options in a list called the wavefunction. Once you measure the system, the wavefunction “collapses” and the unit assumes the properties you observe. The weird stuff kicks in when you “entangle” particles together, making them interact in a way that the particles must be described using the same list of probabilities. No matter how far apart the particles separate, they still seem to be aware of one another, such that observing the properties of one immediately causes the other particle to assume its corresponding property. The Chinese scientists bestowed photons from a laser with different polarizations (the direction their waves travel perpendicularly to the photon’s forward motion) by passing the light through a series of crystal, filters, and mirrors. Their experiment then splits the beam, keeps one of the two entangled photons on one side, and passes the other one through a ten-foot-long tube containing one of several seawater samples. It worked, according to the paper, and the researchers calculated that they’d successfully entangled the photons, even after passing one through the water-filled tube. “It encourages us to look into a longer achievable communication distance,” they write. These results are a proof-of-concept, for sure—the particle still travels through a tube and only over a few meters, a distance over which you might as well just verbalize the message out loud. Researchers have already entangled photons through space over a thousand kilometers. One physicist was unsurprised, and another was skepitcal that the researchers would set up a much longer link, reports New Scientist. “Because ocean water absorbs light, extending this is going to difficult,” University of Missouri computer science professor Jeffrey Uhlmann told them. But another source said that maybe submarines could use such a channel to communicate securely. But you won’t know unless you try, I suppose. Scientists &apos;Teleport&apos; a Particle Hundreds of Miles—But What Does That Mean?